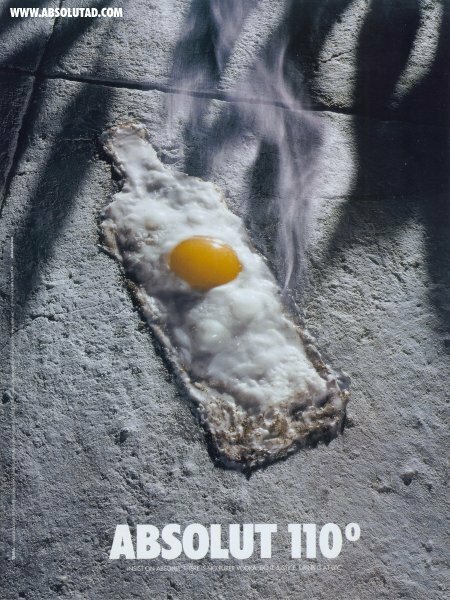 ABSOLUT 110� is a very unique ad: it features an egg, sunny-side up, on a very hot, gray surface. There's a yellow egg yolk surrounded by the egg whites and it's shaped like an Absolut bottle. This ad is a cross between Absolut Vodka 110 Proof and the old saying "It's so hot that it's 110� in the shade!". Printed up the left margin of this British ad it the typical Absolut info, including TBWA and �1996 . Printed under the logo is "INSIST ON ABSOLUT. THERE IS NO PURER VODKA. DO IT JUSTICE. DRINK IT AT 0�C."